If you are interested in having an aluminum fence installed at your home in Belleville, Illinois, or a nearby community, trust the experts at Chesley Fence & Deck to take care of the job. 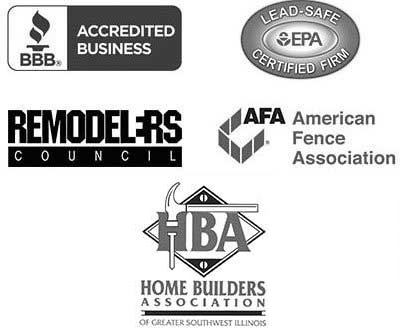 Since 1967, no other company has installed more fencing then we have thanks to our unparalleled reputation for providing premium products and outstanding installation services in the Metro East region. It undergoes an 11-step powder coating process which results in long-lasting beauty, as the paint will not peel or chip. 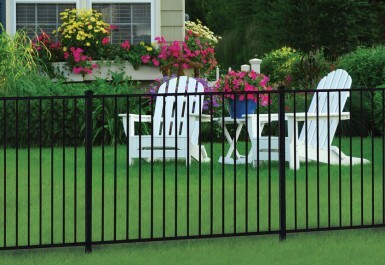 All rivets and screws are concealed, and we use screwless panels, adding to the attractiveness of the fence. It can be fitted with accessories, such as finials and scrolls, allowing you to customize your aluminum fence to your liking. You’ll get to select from three attractive colors: black, bronze, and white. What’s more, we go the extra mile to ensure the fencing we install at your home precisely meets your needs. For example, our technicians can install your aluminum fence in virtually any configuration, and we offer options with two inch gaps between the pickets – instead of the standard four – if you’re worried about preventing small pets from escaping your yard. You can rest assured that our technicians have the experience and training to install your fence correctly, as they are all our own employees and not subcontractors. And, for your peace of mind, we offer a three-year labor warranty and will also pass along the lifetime product warranty from the manufacturer. To learn more about the benefits of having Chesley Fence & Deck install an aluminum fence at your home in Belleville, IL, contact us today.